Believe it or not, your hands can be your best secret keeper, defying your real age. 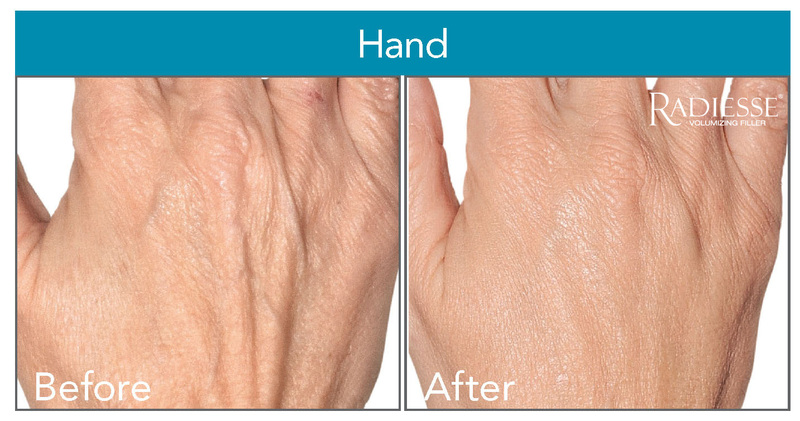 Simply by restoring elasticity with Radiesse (the only filler approved in Canada for rejuvenation of the hands), a natural filler that fills and plumps the skin on your hands, replacing lost volume, softening their look and feel, and stimulating your collagen production- all for long-term results that typically last up to 12 months. Of all the stories your hands can tell, your age doesn't have to be one of them! Radiesse is an FDA approved volumizing filler to rejuvenate hands with long-lasting results. Only Radiesse volumizing filler is indicated for hand rejuvenation in Canada. It also stimulates your natural collagen production to help improve the structure of your skin. Radiesse is an ideal dermal filler for those who have hands that have a sunken appearance with visibly apparent bones, tendons, and veins. 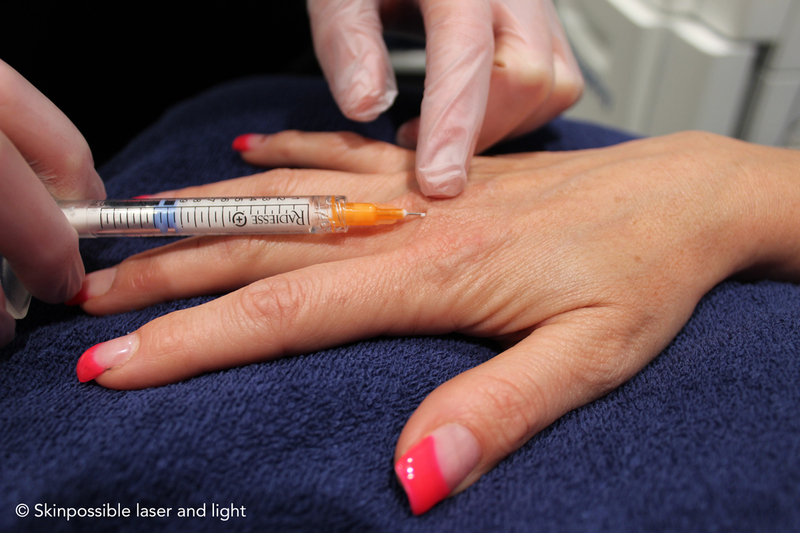 Radiesse dermal filler is a long-lasting choice that adds volume to the hands making your hands appear younger looking. • You seem more aware of your hands lately? • Exposure of your hands in daily social interactions (handshakes, gestures, etc) can cause you feel uneasy? • You wish there was something you could do to make your hand look younger? • Aging of the hands can be seen in a change in texture and loss of fat and muscle (Volume loss). Turn back the hands of time with Radiesse! How does Radiesse work? 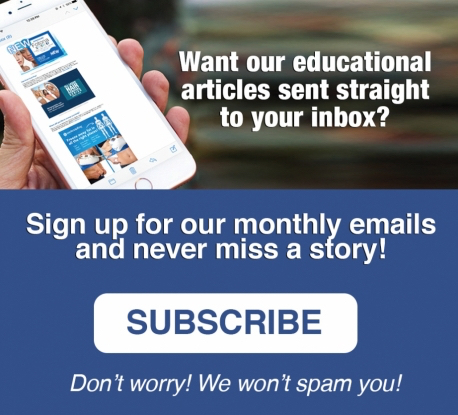 What to expect during the treatment? It is injected into the skin of the hands to soften creases or folds, support areas of volume loss so they have a younger appearance. Local numbing medication may be used to maximize your comfort during the procedure. Most patients report only mild discomfort typically associated with needle injections. To ensure an even correction, the physician will massage the area treated, which may cause a temporary, minimal to moderate amount of redness to your skin. Bruising at the site of injection is commonly reported the side effect. To minimize bruising avoid blood thinners such as ibuprofen, aspirin or herbal preparations prior to treatment. Temporary minimal to moderate swelling can be expected. Swelling can persist for 2-3 weeks in some patients and may begin 1-2 weeks after the treatment. Warm packs and hand elevation can help reduce swelling. It's normal to feel firmness at the injection site for a few days after treatment. The area will soften over time, leaving your hands with the soft and natural look. 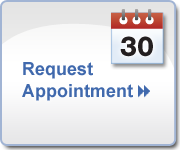 Many patients return to their normal routine/activities immediately after treatment. If necessary, applying a warm pack or compress to the injection area after treatment to help reduce swelling. When possible, elevate your hands, which will also help reduce swelling. Sunbathing, or excessive UV exposure should be avoided until the redness or swelling have subsided. The injection area may also be gently washed a few hours after treatment, avoiding aggressive scrubbing or rubbing.